The Forestry Challenge is an academic event for high school students in technical forestry and current forestry topics. Since its inception in 2003, the program has grown from one event to five, a complete buildout of the program in California. Participants spend four days in the forest learning about the ecology and management of the forested landscapes that provide communities with water, recreational opportunities, wood products, and wildlife habitat. Youth benefit by better understanding the relationship of the forested environment to their community, by exposure to natural resource management as a potential career option, and by undertaking a rigorous critical thinking exercise which is timely and addresses current forestry topics such as wildfire, insects, and forest health. 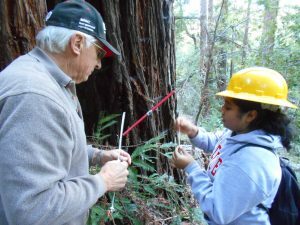 Teach students the basic principles of forestry, connecting classroom math and science to hands-on experiences with real-world applications, enabling them to make recommendations about natural resource management. Give students the opportunity to explore careers by interacting with natural resource professionals including foresters, hydrologists, soil scientists, wildlife biologists, and fire scientists. Provide an opportunity for a diverse student population to experience outdoor recreation and develop an appreciation for the forest and its benefits to us all. 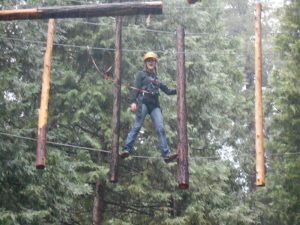 Extracurricular activities can include a night hike in the woods with a biologist, zip line, ride on a narrow gauge railroad, and evening bonfire. Students are more likely to choose a career path in natural resources and attend college. Students participate as a team representing their school and learn important lessons of cooperation, teamwork and public speaking. Field Training: Forestry professionals spend time with the students familiarizing them with common tree species, forestry tools, and the use of identification keys. This training serves as a review of the “learning objectives” and associated resources available on the website. 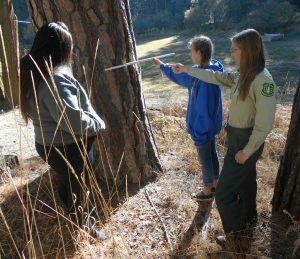 Field Test: Working as a 2 to 5-person team, students complete a comprehensive field test, which includes identifying and measuring trees, analyzing stand data, and making forest management decisions. The scores from the testing stations are combined, and become 60% of the team’s final score. Focus Topic Fieldtrip: Students are presented with a current focus topic and visit the site of a case study to ask questions and collect data. They use the information they collect to weigh in on the topic, often influencing the decisions made about managing the forest in the future. Focus topics in 2015 included community wildfire protection, mobile app development, even-aged plantation management, and forest inventory. Presentation: Guided by two consultation sessions with a Registered Professional Forester, students use all available information to put together a 15-minute presentation. A panel of three judges scores the presentation, which is worth 40% of the final event score. Top teams have given these presentations to the CA Board of Forestry, the CA Licensed Foresters Association, and the Forest Landowners of CA.